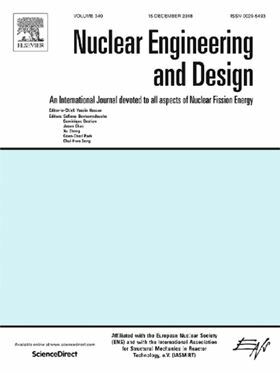 The research article 'Design and CFD performance analysis of a novel impeller for double suction centrifugal pumps' has been published in Elsevier journal Nuclear Engineering and Design (Volume 341, January 2019, Pages 155-166). Double suction centrifugal pumps are the main devices involved in the feedwater system of nuclear power plants and they are responsible for a significant share of their energy consumption (by affecting the balance of both the gross and net electrical energy production), hence even an efficiency increase of only a few percentage points could be substantial in their economy. Herein a novel impeller designed for low-medium specific speed double suction centrifugal pumps (nq<60) is proposed showing an efficiency improvement with respect to conventional designs in the order of 1–2% associated to a slip factor increase, secondary losses reduction and impeller outflow homogeneity improvement. The novel double suction impeller is characterized by a new arrangement of its flow channels, which come up alternately on the same circumferential exit even if they start from the two different sides. The flow field through the impeller is investigated via numerical simulations run by means of the open source CFD code OpenFOAM and its performance is compared against experimental results. The CFD model set-up, in terms of grid size and discretization schemes, has been previously assessed against results of consolidated CFX simulations on a conventional centrifugal pump. Electromagnetic pumps are widely applied in sodium-cooled fast reactors to deliver liquid sodium.